Privately owned studio condo located in Rimfire Lodge, the heart of Snowshoe's new mountaintop village. Condo offer a spectacular western mountain views with fantastic sunsets, gas fireplace, full kitchen, and much more. Starbucks Coffee is on the first floor next to the lobby. For complete information on all of our properties at Snowshoe, please go to our website "Rimfire Retreat" at www....com or use the link below. Opened in the summer of 1999, the lodge offers direct slope access (ski-in/ski-out), ski and bike lockers, outdoor hot tubs, sauna, fitness room, Alpenglow hearth room, restaurants, shopping and heated underground parking garage with elevator service. 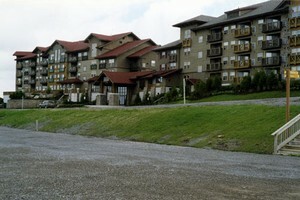 Rimfire Lodge is adjacent to Snowshoe's new Split Rock Aqua Center. 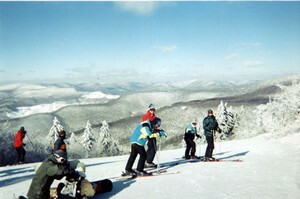 Snowshoe Mountain Resort is considered the premier ski resort East of the Rocky Mountains and South of New England. In addition to the skiing, there are many winter activities and events to choose from including tubing down Ruckus Ridge, a snowmobile tour. The following statistics will help you understand the mountain: average snowfall of 180 inches, 60 trails ranging from beginner to expert, 2 expert trails with 1500 feet of vertical drop and 1.5 miles long, 100% snowmaking on 275 acres of terrain, Night skiing on 14 trails at the Silver Creek ski area. 3 high-speed detachable quad lifts, 2 fixed quad lifts, and 6 triple lifts. For the younger skiers try the magic carpet at Snowshoe and Silver Creek. 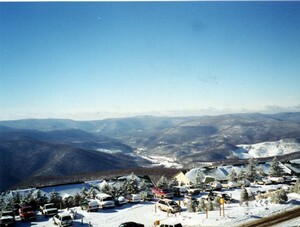 Snowshoe Mountain is a four-season resort. During the summer when temperatures almost never reach 80, play the Gary Player designed Raven Golf Course (formerly Hawthorne Valley Golf Course) - rated "top 100 in the country" by Golf Magazine. Bike and hike the miles of trails that Snowshoe offers on their 11,000 acres. Canoe, kayak or paddlebike on Shaver's Lake. Let the kids spend the day at the Outpost Adventure Park skateboarding, rockclimbing, and racing on the BMX track. There are many other summer activities and events to choose from. From mid September through October view the fall foliage. Gas fireplace, elevator service, underground parking, adjacent to split rock pools, private ski lockers on first floor, and ski-in/ski-out. Cass Scenic Railroad, The Highland Scenic Highway, The Greenbrier River Trail, Cranberry Wilderness Area, Monongahela National Forest, Falls of Hills Creek, Droop Mountain State Park, Beartown State Park, Lost World Caverns, The City of Marlington, Seneca State Forest, The National Radio Astronomy Observatory, and Watoga State Park. 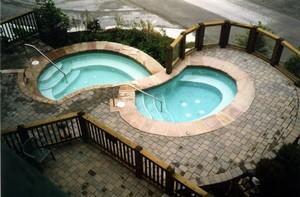 View of the Hot Tubs from this condo. Western mountain view from Condo's sliding door. Condo sleeps 4 on queen size bed and queen sleeper sofa. Cupp Run is 1500' vertical,1.5 mile of expert terrain. 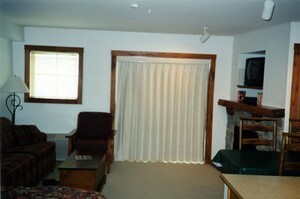 This is a very well maintained studio unit in the Rimfire lodge. The advantage of a studio vs. the junior studio is a full kitchen, a larger eating area and one permanent bed instead of a murph bed. The location of the unit was in the middle of the Rimfire complex which put it close to elevators, laundry one floor above, access to the garage and Starbucks. We really enjoyed our stay here and appreciated the direct contact with the owner. We will look here for when visiting Snowshoe. Just wanted to say thanks so much for everything! We had a great time at Snowshoe last weekend. We had the best weather and your location was perfect for us. We went back and forth to the chair lift, pool and village alot. Much more convenient than our last stay when we were in the Summit. Thanks again and I will keep your E-Mail address for the future. By the way... your guest book was adorable but I had no pen to sign when we were packing up and leaving. We did notice a guest in your book that we know. What a coincidence!! Just a note to say we enjoyed our stay in Rimfire #307 at Snowshoe this past week. You have a nice place up there and we hope to return next season. Henry - My family and I returned today from Snowshoe and we wanted to let you know how much we enjoyed the Studio at Rimfire. The skiing was great and the accommodations were wonderful. Would you believe that I could not find a pen this morning and I was unable to write in the guestbook but I wanted to let you know that we enjoyed ourselves immensely. We are planning to possibly go up this summer for the Brews, Blues and BBQ festival. If we do, hopefully one of your places will be available! in your studio at rimfire. We plan to come back sometime in February. Hopefully one of your units will be available. I will be in touch. 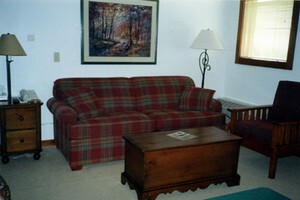 Just wanted to say thank you for allowing us to rent your studio at Snowshoe. We loved the place and had a great "fall foliage tour". Again, thank you so much-it's a beautiful place and we may contact you again about staying there next summer. All rates are for a 2 night minimun. From 12/3/11 to 12/15/11 and from 3/5/12 to 4/1/12: If your stay includes a weekend, add $10 per weekend night for the Studio. 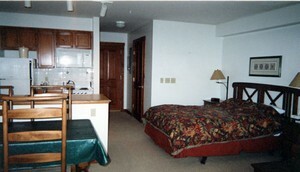 From 12/16/11 to 3/4/12: If your stay includes a weekend, add $35/weekend night for the Studio. Discounted rates are available for stays of 3 nights or more. Deposit: A minimum deposit of one night's rate is required to secure the reservation. The balance is due at least 21 days prior to check-in date. Cancellations and Refunds: Cancellations made 30 days or more prior to check-in date shall be subject to a $50 administration fee. The balance of your deposit will be refunded. Cancellations made less than 30 days of check-in date will result in forfeiture of total deposit. Cancellations made less than 21 days of check-in date will result in forfeiture of total payment.